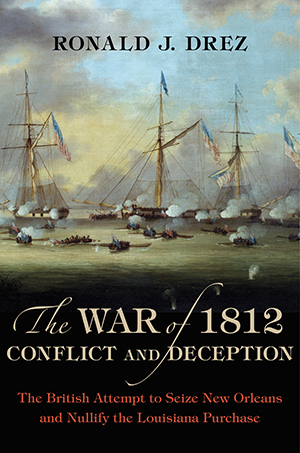 “his thumpingly entertaining and case setting book"
"A feisty, first-rate history of the War of 1812 and the Battle of New Orleans. "Ron Drez has chronicled over 160 years of great victories and great challenges that shaped a community of young men, their families, and their teachers that began in New Orleans in 1847." President Emeritus, Father Anthony McGinn, S.J. "As no other book has ever done before, Voices of Courage takes you through one of the most grueling and terrifying battles in American History." Voices of Valor is an irresistable chorus of personal memories about every aspect of D-Day. Just when you think you've heard it all, a new story of courage, fear, brotherly love or combat humor takes you back to that fateful day in June 1944, and the invasion that remains a military wonder. "Drez is in sync with his interviewees, and his facile pen brings their stories to life." "This book is an easy read, filled with many many facts previously not read, and the short stories of various battles, with specific people was EXCELLENT. Best author since Ambrose I've read in years." "This introductory book for young people skillfully intertwines these soldiers' voices with dramatic events in a compelling historical narrative of the Allied D-Day invasion of France on June 6, 1944." "I thoroughly enjoyed this book and must say Drez did an outstanding job of putting it together. I was mesmerized by each man's story, and while I like reading about Bradly and Patton and Eisenhower; these are the stories that really stand out to me. I am thankful that there are people like Drez who want to preserve these priceless stories for future generations. Read this book - you will love it!" "Voices of D-Day is history at its best!" - Major Richard Winters, Easy Co. While it's common to say the most predictable thing about the next war is the unpredictability, that wasn't the case in the run-up to war with Japan. From Commodore Matthew Perry's voyage into Japanese waters in 1853 to the attack on Pearl Harbor in 1941, the United States and Japan were on a collision course. The saga is here brought to vivid life using primary-source documents, memoirs, and firsthand testimonies of those who lived during that era. It was Gen. Billy Mitchell who recognized the signs and foresaw the eventual showdown between the two nations twenty-eight years before the tragedy of Pear Harbor, but his spot-on predictions were dismissed out of hand. Discover one of the most exciting periods in American history through General Mitchell's prescient reports, providing new insight into an ages-old confilct. "With the riveting skill and psychological insight of the most passionate thriller writer, Ronald J. Drez takes us on an unforgettable excursion into the American past that shines the light of his prodigious research onto the intricately entangled political and military issues behind one of the most pivotal--and least understood--wars in American history." Tracing the Jesuit presence in the New World and in the vast, untamed territory of Louisiana beginning with the Mississippi journey of Father James Marquette and Louis Joliet, Ronald Drez presents the Jesuit history of dedication, defeat, disease, Papal suppression and restoration of the order to the eventual founding of a remarkable school for young men in New Orleans. In the words of President Emeritus, Father Anthony McGinn, S.J. concerning the school, "Ron Drez has chronicled over 160 years of great victories and great challenges that shaped a community of young men, their families, and their teachers that began in New Orleans in 1847. In this powerful and engaging historical narrative, decorated combat veteran and critically acclaimed author Ronald J. Drez unfolds the astounding tale of the arduous Greek Resistance against the Axis Powers in World War II. Along with Great Britain, Greece was the only country to stand against the Pact of Steel and the dreaded Nazi and Fascist regimes of Hitler and Mussolini. Although Greece technically fell to Germany in 1941, the indomitable spirit and courage of the Greek people never did. Indeed, the Nazis feared the fierce Greek Resistance fighters so much that Hitler was never able to seize control of any Greek land. Weaving through political intrigue at the highest levels, this compelling narrative tells the stories that made up this oft-forgotten part of World War II history: Italian Dictator Benito Mussolini’s obsession for military dominance and desire to be Adolf Hitler’s equal; Greek leader Ioannis Metaxas’s indefatigable leadership and cry of “OXI!” (NO!) when presented with the Italian ultimatum to surrender Greece or be invaded; the tale of one the great sabotage events of World War II, Operation Harling, the demolition of the Gorgopotamos viaduct, which was the main German supply route for their forces in Egypt; and the extraordinary story of Dennis Georges, just nineteen on the day of the German invasion, Georges left Athens, setting out for the family farm in Arfara where he became part of the Greek Resistance. In this meticulously researched volume, Drez has succeeded in shining a light into one of the most overlooked aspects in the great annals of World War II history. Packed with personal testimony and many rare photographs and illustrations, Heroes Fight Like Greeks is an indisputably important report on one of the most harrowing stories of World War II. Voices of Courage: The Battle for Khe Sanh, Vietnam tells the story of one of the most heroic efforts in American mililtary history–a seventy-seven day struggle in early 1968 for the remote Khe Sanh Combat Base–during which six thousand perilously isolated Marines withstood the onslaught of a superior enemy force. Drawing on a vast archive of recorded interviews and written material collected over the past twenty years by Ronald J. Drez and the Eisenhower Center for American Studies at the University of New Orleans, authors Drez and Douglas Brinkley provide a gripping narrative addressing every aspect of the battle, interwoven with testimonials from soldiers who fought at Khe Sanh. Featuring two audio CDs that provide a unique opportunity for these valorous voices to be hear, Voices of Courage urges a long overdue recognition of the stunning fortitude displayed by Marines and other members of the U.S. Armed Forces at Khe Sanh, and promises to reshape the way we remember the Americans who fought for their nation in Vietnam. Published for the 60th anniversary of D-Day, Voices Of Valor, a lushly illustrated book with audio CDs, presents gripping, firsthand accounts of the Normandy invasion with a central narrative by one of America's preeminent historians. Voices Of Valor is an intimate and lasting tribute to the soldiers who fought in Normandy featuring 40 interviews drawn from the archival holdings at the Eisenhower Center Oral History Project, the largest collection of oral histories of D-Day. Within the book are two hour-long audio CDs containing the oral testimonies of veterans who were at Normandy. From the sinking decks of a navy cruiser to the cockpit of a doomed B-25 bomber, Ronald J. Drez takes us to the front lines of World War II. Through Drez's gripping narrative style, we are introduced to twelve men, all ordinary soldiers, and learn what the war was like through their eyes, experiencing their own "twenty-five yards of war." These tales of survival against incredible odds speak to the extraordinary combination of bravery and miracle that served to bring the men back alive, and are a result of ten years of research and over 1,400 interviews. National Geographic honors the 60th anniversary of D-Day with a significant new volume. Remember D-Day combines compelling narrative, dramatic archival photographs and memorabilia, detailed maps, and a time line to bring readers the exciting story of one of the world's most daring invasions. Ronald Drez reveals the story of D-Day from January 1944 - five months before the invasion at Normandy - through the attack itself. Readers learn of the careful planning, daring missions, and elaborate schemes that helped launch the raid that was the key to the Allied victory against Nazi Germany in World War II. They'll go behind the scenes and witness Operation Doublecross in which captured German soldiers were forced to become double agents and deliver false information to their commanders; and Operation Mulberry, in which Allied forces created their own ports to tow across the English Channel. First-person accounts from survivors on both sides help paint a vivid portrait of what it was like to plan, participate in, and live through D-Day on June 6, 1944. This landmark book will provide children with valuable insight into the significance of the invasion and help them understand D-Day in the overall context of the war. A project conducted by the Eisenhower Center at the University of New Orleans, this selection of oral histories (augmented with excerpts from published memoirs) comprises the recollections of the Normandy beachhead on June 6, 1944, by Americans, British, Canadian and German soldiers plus a handful of French civilians. Pathfinders, commandoes, airborne troops, glider pilots, landing-craft coxswains, infantrymen, combat engineers, men of all ranks, recall the confusion and disorientation of that dreadful 24-hour period with its shocking tactical confrontations, unexpected terrors and impersonal slaughter. Through these vivid, succinctly spoken accounts, readers experience vicariously one of history's great military moments. Drez is assistant director of the Eisenhower Center. With a foreword by Major Richard Winters, Easy Company, 506th PIR, 101st Airborne, and published to commemorate the 60th anniversary of the Normandy landings, this book brings together the perspectives and opinions of some of the most respected military historians working today. More than a dozen leading historians from either side of the Atlantic have collaborated to produce a unique and incisive examination of the momentous events that surrounded June 6, 1944. Operation Overlord saw some of the Allies' greatest military strategists, Eisenhower and Montgomery, pit their wits against Hitler in a bold bid to liberate continental Europe. Each chapter of this new book focuses on a different aspect of the D-Day landings, from the build-up to the attack to the experiences of the troops on the ground.